September 29, 2012 at 10:30 pm. Just after midnight on Saturday May 6th, Alan Blueford and two of his friends were waiting for some girls to pick them up on 90th Ave., in East Oakland, after the Floyd Mayweather fight. Not long after Alan had phoned his parents to check-in with them, a car slowly pulled up to them with its lights off. Alan ran. One officer gave chase. A few blocks later Alan was shot by OPD officer Miguel Masso. Masso also shot himself in the foot. Over a dozen witnesses all said that Alan had no weapon and posed no threat to the officer. Why did the police approach Alan and his friends with their lights off? Why did they give chase when Alan had committed no crime and posed no threat to the officer? Why was Alan shot three times when he had no weapon? How did a trained officer shoot himself in the foot? From the witnesses’ statements, why was Alan not given emergency CPR by OPD? Why did the OPD change their story to the family several times in the days after the shooting? Why have they refused to release the coroner’s report, despite the fact that it has been complete for weeks? The family has gotten nothing but lies, distortions and stalling from the OPD. Officer Miguel Masso be fired and charged with Alan’s murder. 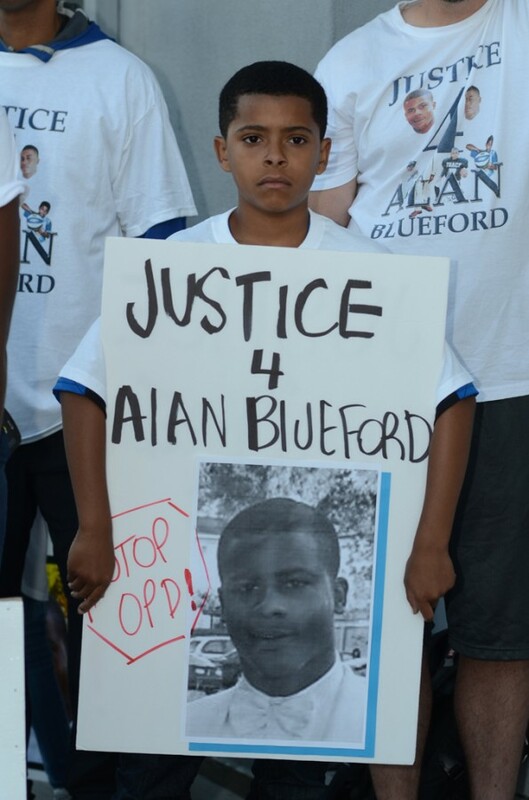 OPD Chief Howard Jordan be held accountable for lying to the Blueford family. An end to stop-and-frisk and other police practices of racial profiling. The repeal of the Police Officers’ Bill of Rights, that shields violent cops from prosecution and keeps them on the street.